A central component of our farm’s mission is land regeneration. We methodically practice holistic management to transform land that was previously row-cropped, in the industrial model, into productive, pastured landscapes. This is a lengthy, arduous process that typically requires over half a decade to once again achieve full soil cover. 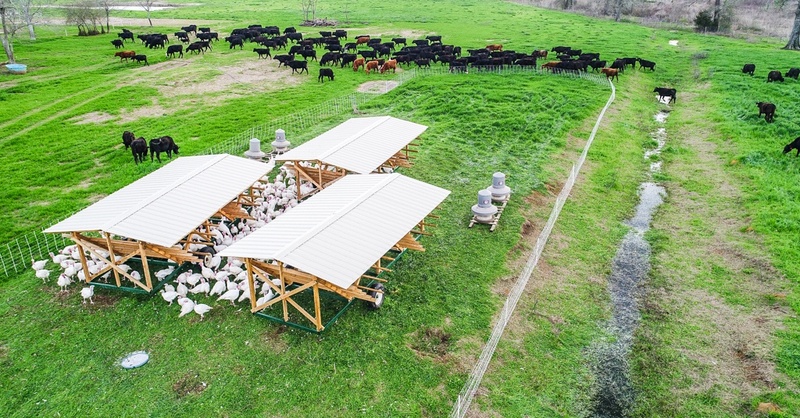 Leveraging multiple species of livestock is the centerpiece of our strategy. Poultry, in particular, have a unique role in this process, and require careful consideration as we graze ruminants. Pastured poultry aerates the soil and amends the soil with carbon and nitrogen from manure deposition. 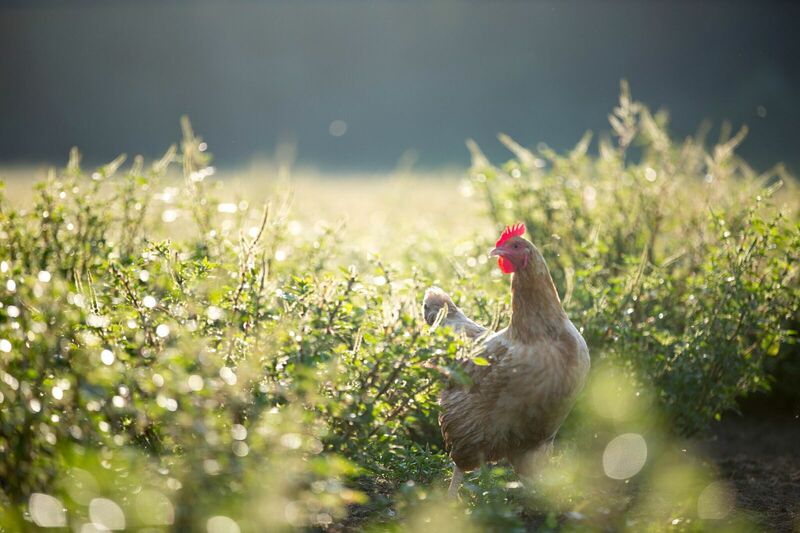 “As the birds disturb the surface of the pasture, they create the proper conditions for grass seed germination,” states our Poultry Production Manager, Jeff Lackey. Jeff goes on to say, “In a pasture, the seed may be there, but without proper conditions, it will not germinate.” Turkeys, and especially laying hens, have vigorous feet, which help disturb the pasture surface, aerate the soil, consolidate litter and manure, and increase organic matter in the soil. 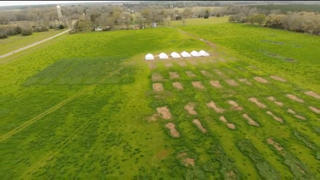 A aerial view of the impact our pastured turkeys and grass-fed cattle have on our land. 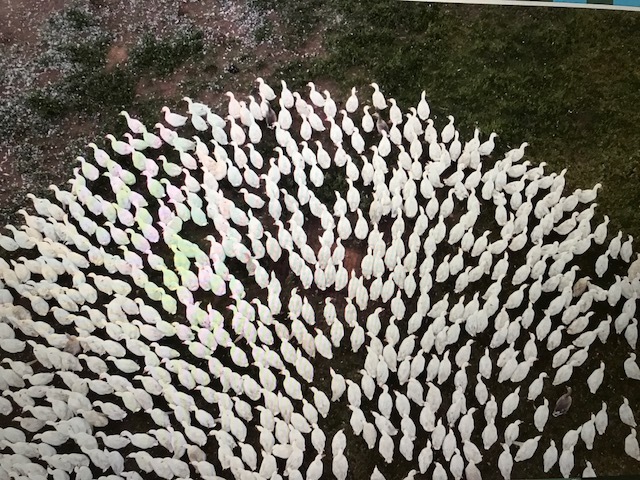 The pasture tailing behind the poultry flocks as they are moved across the pasture has a distinct growth pattern, one that is vibrantly green and diverse in composition. We feed our birds with non-GMO feed, which adds organic material and nutrients to the ground as they pass manure. 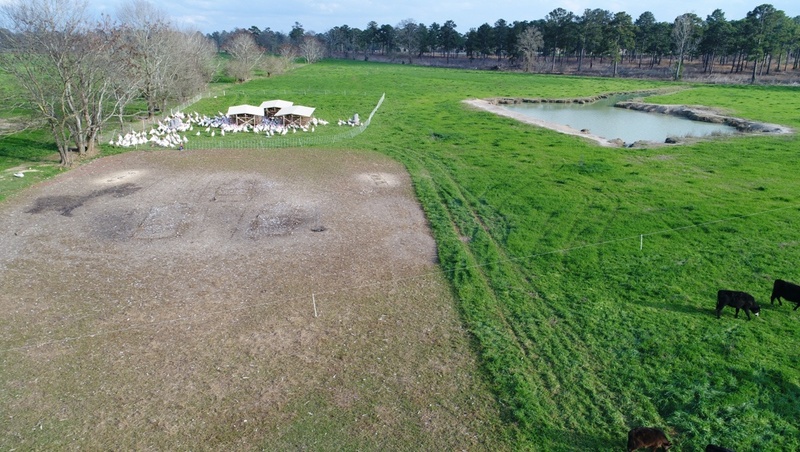 The pasture properly impacted by poultry visually validates the benefit of added nitrogen gained from our poultry manure. It is easy to see that the Serengeti multi-species grazing model contributes to regenerating robust land and raising healthy animals! When we plan our grazing, estimate a volume of forage available and the number of days a herd can stay in a pasture, a flock of poultry is factored into the equation. Jeff points out that “we must account for the presence of poultry when planning grazing, as the volume of forage consumed is significant; laying hens, broilers, ducks and especially geese are very thorough grazers.” Geese are herbivores, able to subsist entirely on quality pasture, with a beak and tongue that makes them best grazing poultry species. The above image demonstrates our turkey set "tails". 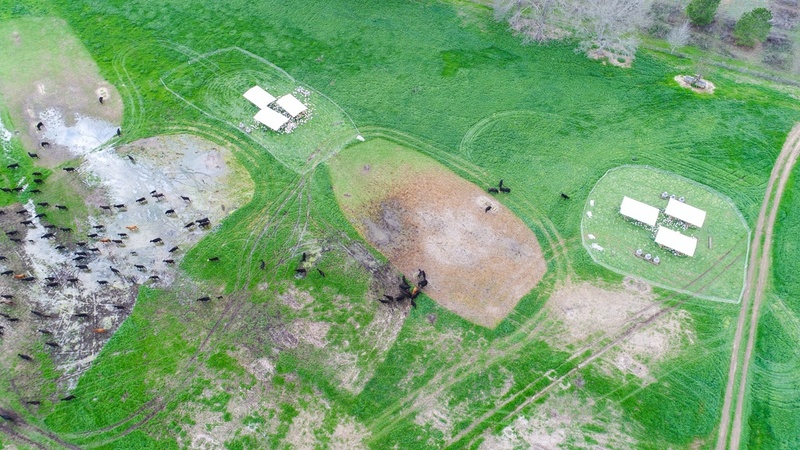 The grazed area can be clearly distinguished as the brown ovals where the manure and grazing impact of the turkeys has left a cover over the soil. This will decompose and provide additional nitrogen and carbon to that patch of land. In the long term, this will increase the productivity of this patch of land.